After such a stressful week, the prospect of visiting Nurture Spa in Tagaytay today was a welcome alternative to an otherwise busy routine. And Tagaytay seems to feel much closer to Manila than before. I remember one time we decided to go to Tagaytay after some drinks just for coffee, bulalo and the cool weather of course! We were greeted by an ensemble of native instruments as we entered Nurture Spa. We were served warm salabat (ginger tea) as well as some snacks which included suman, mangoes and hot chocolate before we got our spa treatments. We got to tour the facilites before our treatments. 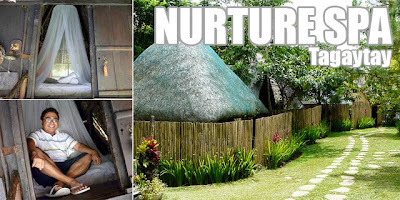 You can actually stay overnight or even longer at Nurture Spa and it's perfect for dates. Some come from as far as abroad for the healing treatments, a combination of massages and the proper diet. And there have been a lot of testaments from those who got better from this alternative healing. Just like in Nurture Spa Abe's Farm, I chose the hilot treatment which I rarely get in spas here in Metro Manila. And it was a really relaxing treatment since I fell asleep in the middle of it! Lunch was healthy as well. 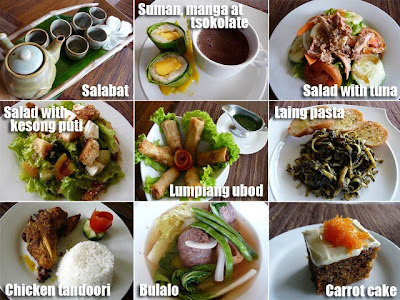 I had a salad with Nurture Spa's signature salad dressing, lumpiang ubod and laing pasta. The others ordered tandoori chicken and bulalo. The carrot cake dessert was great. I'm looking forward to my next treatment, maybe this time in Abe's Farm again. Hi Ivan, hom much did you pay for the spa massage? Is it affordable including the meal? by the way, can you embed comments below post for easier commenting?